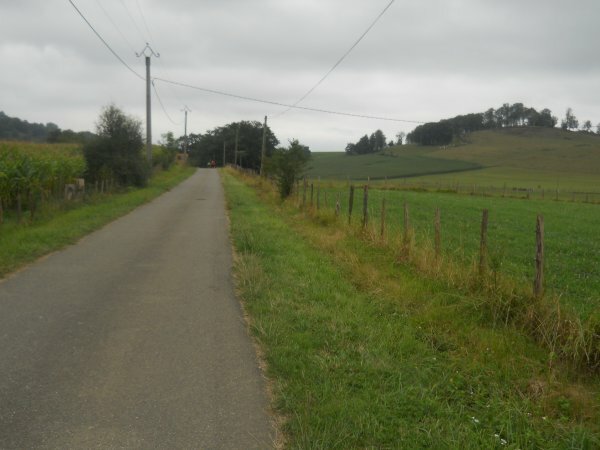 Another Long Walk: Day 24: Saint Jean! 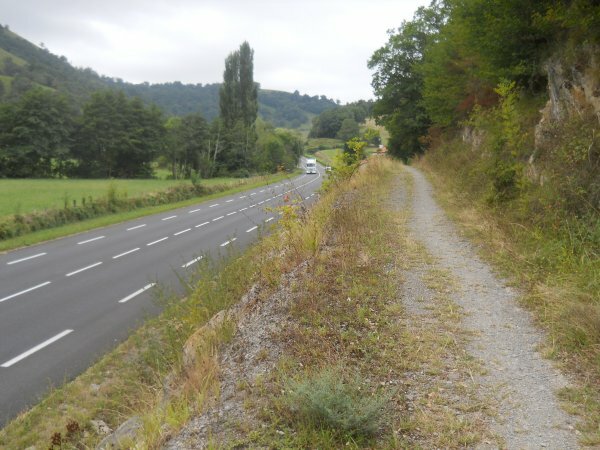 September 4: Today was a big day for me--for today, I intended to hike a short 21 kilometers into Saint-Jean-Pied-de-Port: the official end of the Chemin de Le Puy route and the beginning of the Camino Frances. It also would mark the psychological halfway point for me on my way to Santiago. 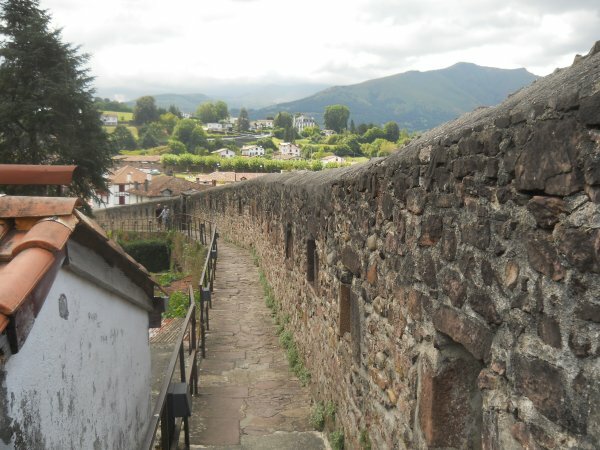 Spain was just around the corner, where the people spoke Spanish--a language I knew far better than French. 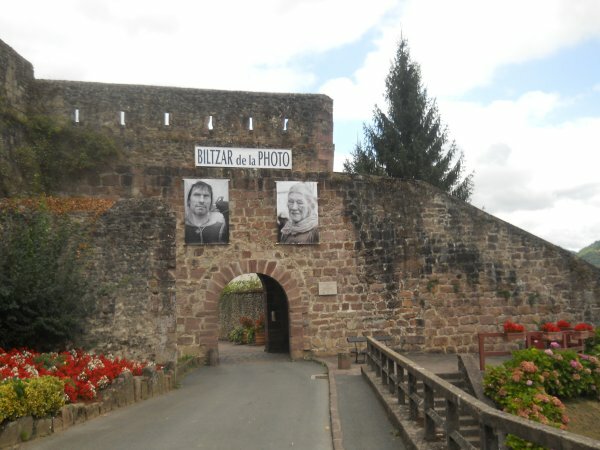 And, barring some sort of unexpected tragedy, I could expect to cross into Spain tomorrow. I woke to gray and cloudy skies, but no rain was expected. 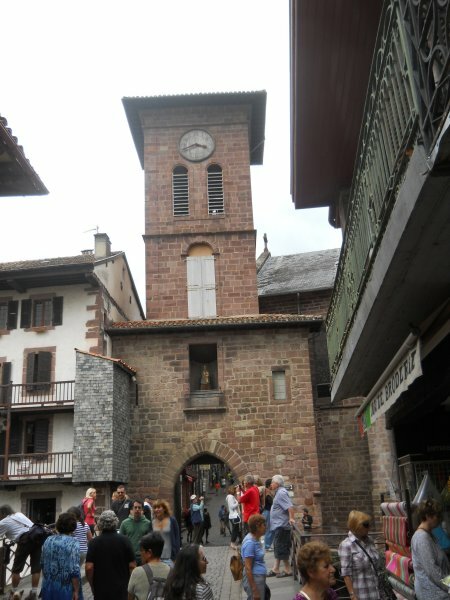 In Sain-Jean-le-Vieux, I stopped in the town square, sitting on a bench to eat some snacks and rest for the final push into Saint-Jean-Pied-de-Port. I ate an apple, resting my feet, and a couple of minutes later an older woman started opening the shutters of a house across the square. I waved to her, and she waved back--then waved me to her window. I didn't really want to get up and walk over to her--I was resting!--but I did to be friendly, and naturally, she spoke to me in French. I tried to explain that I didn't know any French and told her that I was from the United States. She asked if I was hiking to Saint Jacques, and I said, "Oui." She signaled for me to stay put then left the window, but came back seconds later with a tomato, handing it me. She said some more in French that I didn't understand, and I thanked her for the tomato before returning to my bench. I didn't have anything to put the tomato on, so I just ate it as is. 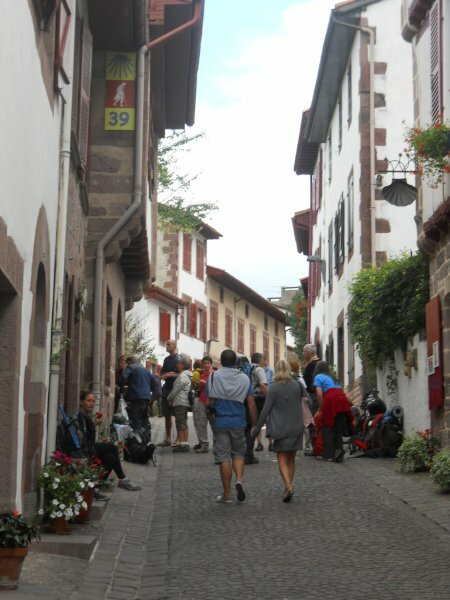 About 20 minutes later, I continued the hike to Saint-Jean-Pied-de-Port, finally walking through an old medieval portal into the town center. Beautiful! I felt absolutely ecstatic I had made it to this point! The trail passed the pilgrim welcome center in town, which was overflowing with pilgrims that spilled out into a long line out the door. Fresh pilgrims. Clean. Soft. 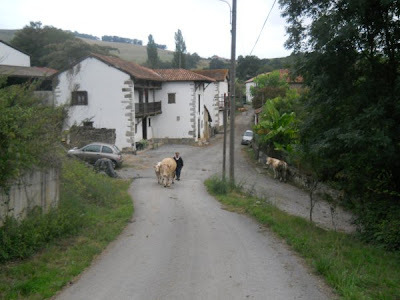 They were probably nervous and anxious, just about to start their journeys to Santiago. They probably felt like I did when I arrived in Le Puy, trying to get my bearings and figuring out what I was doing out there. I had no desire to stand around in any lines, though, so I pushed through the line of pilgrims to the other side and continued on. First thing's first: I wanted to find some lodging. My guidebook shows two hotels with wi-fi that was within my budget, but I struck out at the first one when I found a sign on it that said that they were closed for the day. Closed?! Hotels don't close for the day! Well, I guess this one did, but really? So I wandered down to the other hotel, and they told me they were full. Damn. They suggested a third hotel, though--the Hotel Continental--which wasn't far away. In fact, I had seen signage for it on my way to this hotel, so I retraced my steps a bit to check out the third hotel. This one wasn't listed in my guidebook so I didn't know if it had wi-fi, and when I inquired, they did not. But the next cheapest place I knew had wi-fi was over 100 euros per night--way out of my budget!--so I took a room at the Hotel Continental instead. I'd have to find a restaurant for my wi-fi needs instead. "There have been a lot of Americans this year," he told me. "Yeah," I replied, "it's probably because of that movie that came out last year, The Way." At this point, the desk clerk's eyes lit up and he told me, "They filmed part of the movie here, in this lobby!" along relatively busy roads and not really all that pleasant! But even that couldn't put me in a bad mood today! "Really?" I answered, looking back over my shoulder. I had to admit, nothing about the lobby looked familiar. "Oh, yes," the man told me. "Except it wasn't a hotel in the movie. 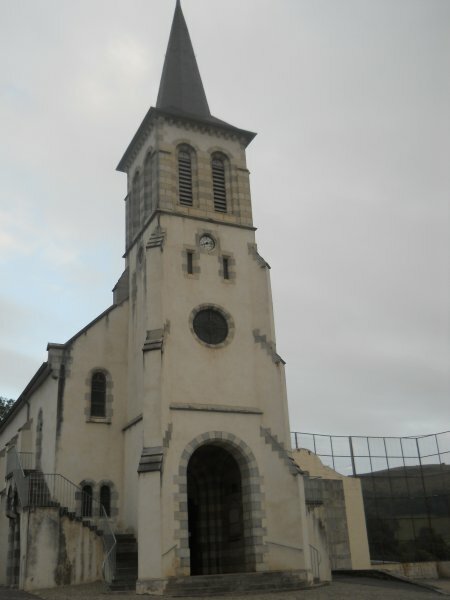 It was where Martin Sheen gets his son's ashes handed to him by the French policeman. What do you call that kind of place in English?" "A funeral home, you mean?" "Yes! A funeral home! The lobby stood in for a funeral home in the movie! And the outside was used in the movie too, when Martin Sheen walks out of the hotel and in the wrong direction." I remembered that scene quite vividly. Even though I had guessed that punchline, I distinctly remember laughing at the scene. It was the first scene in the movie that made me laugh. How cool! "They filmed on the staircase too," the desk clerk continued. "Martin Sheen walks down the stairs, but I was told that they didn't use that in the movie." It sounds like he hadn't actually seen the movie, but I didn't ask for further details. As interesting as I found all this, I really just wanted to check into my room, take a shower, and get cleaned up. I filled out the necessary paperwork to check into the hotel, then he told me to follow him. He pushed the button on the elevator and when the doors opened, ushered me in. The elevator was absolutely tiny and I had trouble turning back around with my pack still on. The clerk reached his hand in the elevator, pushed the button for the second floor (which, in the United States, would have been called the third floor), then the doors closed without him. I was a little taken aback at this point. What happened to the man? I didn't even have the key for the room or even know the room number! I assumed he was running up the stairs to meet me at the elevator two floors up. house the trail passed by! And then it hit me--OH MY GOD--I was on an ELEVATOR!!! Did that count as a form of "modern transportation"? 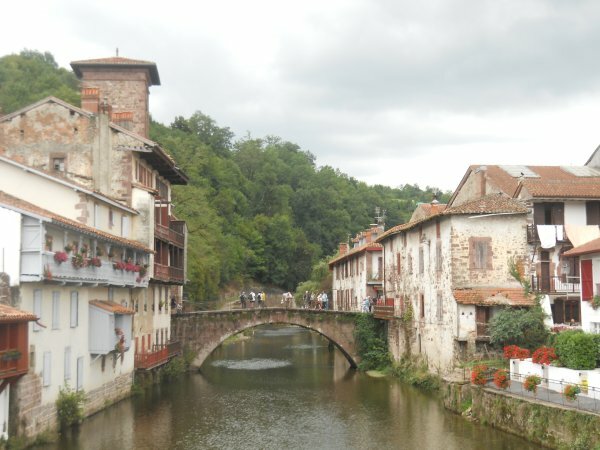 My intention after stepping off the train in Le Puy was not to get on any form of modern transportation until I reached Santiago. I'd been thinking about things like automobiles, buses, trains, planes, taxis, and so forth, but elevators had never even crossed my mind. I hadn't been in any buildings that were tall enough to justify one until now. And while the elevator wouldn't get me any closer to Santiago, it did seem like it should count as a form of "modern transportation." I'm pretty sure that pilgrims a thousand years ago weren't using elevators to get to their rooms. On the other hand, pilgrims a thousand years ago probably didn't see many buildings tall enough to need elevators. In theory, I supposed, they could have created elevators a thousand years ago. Kind of a box with a rope attached to it that horses or people could raise or lower as necessary. The elevator was already ascending--it was too late to get out and walk up the stairs, and I kicked myself for not catching the "elevator loophole" earlier. Nothing I could do about that now, but I vowed that I would not use anymore elevators until I reached Santiago from here on out. At least the Spanish section of my hike would be elevator free. I cleaned up a bit, emptied my pack, then left to go to the post office. My first mail drop, if all went well, should be waiting for me there. At the post office, I waited in line. When it was my turn, I asked if the man knew English, and--somewhat surprisingly--he did! So I told him I should have a mail drop waiting for me, and he asked to see my passport to verify my identity. This was actually the first time I needed to show anyone my passport since going through customs in Paris, but I knew it was expected and had it readily available in my pocket. He checked the name, compared my face to the passport photo, then went in back returning with a medium-sized, white box. I was relieved to see it. I'd never tried having a mail drop sent to me internationally and worried that maybe it hadn't arrived yet. It was a huge relief to see that the box had arrived. He handed it over to me, and I thanked him and stuffed the box into my pack without opening it. I'd open it back in my hotel room, not here at the post office. By now, there was no longer any line at the pilgrim's office so I checked into there as well--mostly to pick up another stamp for my credential, but I welcomed any information they had about Saint Jean or the route over the Pyrenees. Which wasn't much, really, but mostly I was just interested in the stamp. The fellow who stamped my credential looked at my previous stamps--not many people walking into this office had already walked over 700 kilometers before getting there. For most pilgrims, the stamp here was probably the first stamp they got. 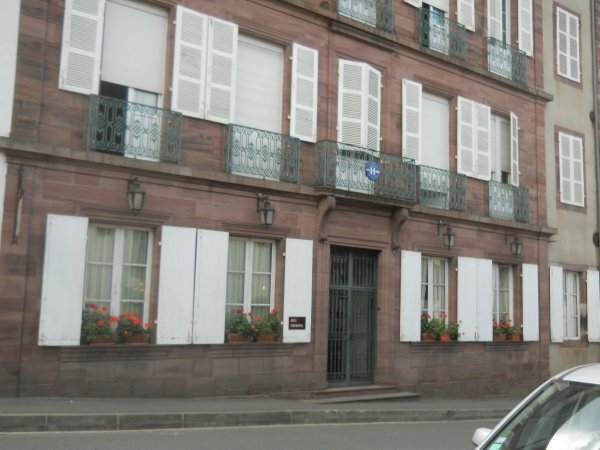 "Ah," he told me, "you stayed at the baker's gite! He's my friend! Did you have breakfast in the back of the bakery?" I smiled. "Indeed, I did!" A pilgrim behind me was listening in, and I had a hunch that she was probably very confused about what we were talking about. 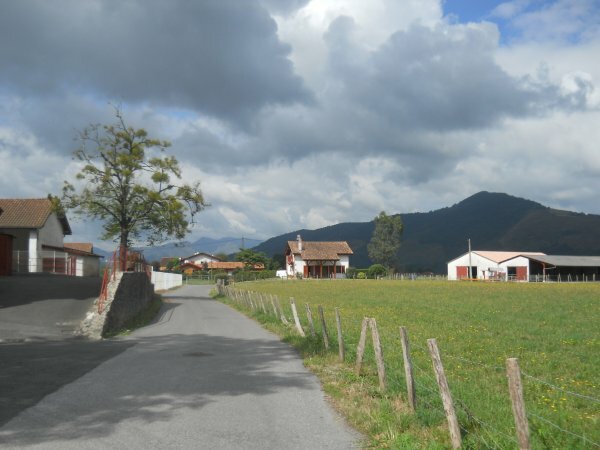 He stamped my credential and gave me a couple of papers with a map of the town and the route over the Pyrenees. I thanked him and headed back out. For dinner, I stopped at an outdoor table at a place offering pizza. I put in my order, and quickly fell into a conversation with a man sitting at an adjacent table who introduced himself as Charles from New Zealand. 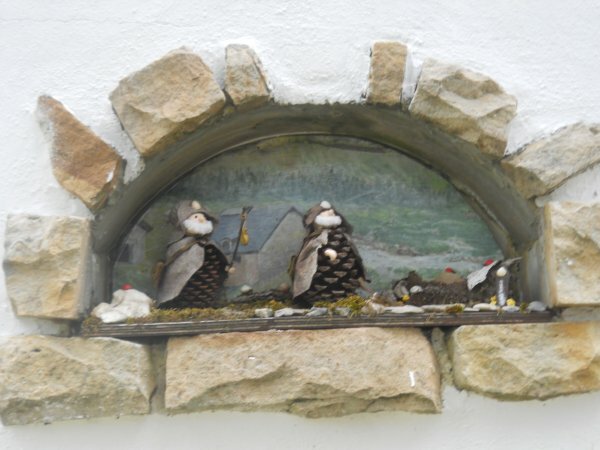 He'd arrived in Saint Jean that afternoon and planned to take the next day off before starting his hike in earnest. I told him a bit about my travels so far, but that since I planned to continue on to Lisbon, I didn't really have time to take any days off. After parting ways, I headed back towards my hotel and noticed someone with a laptop outside of the tourist office and wondered if there was wi-fi available there. I went inside and asked about wi-fi, and they did indeed have it available. They gave me the code for it, and I went outside, sat down, and logged in, Skyping with Amanda and my mom for the next hour or so before going back to my room for the night. 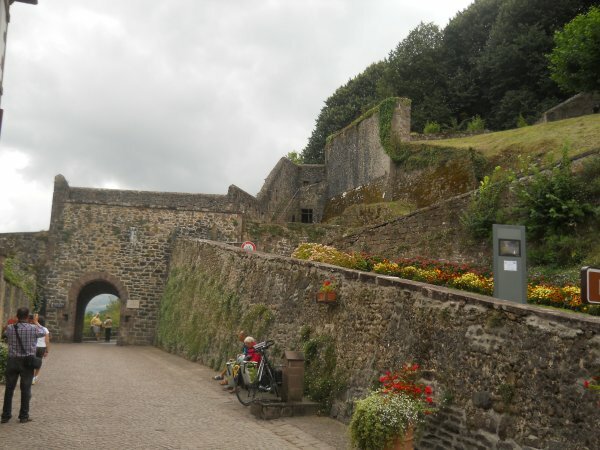 (such as myself) enter the town of Saint-Jean-Pied-de-Port. Looking back at St. James Gate. 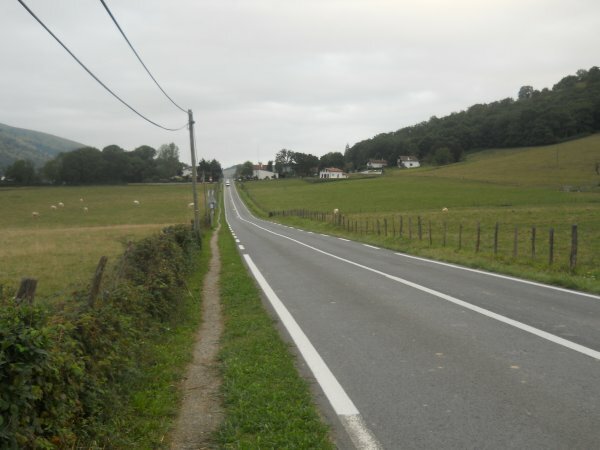 the road! I decided to come back later. on the trail before a large group of pilgrims walks through the scene in the opposite direction. St. Jean is a beautiful little town!